The eighth event in The Legend Series took place Saturday, April 12, 2014 at The Barnett Building during the second annual One Spark festival in downtown Jacksonville. Courses were prepared by Chef Waylon Rivers from Black Sheep; Chef Tom Gray of Moxie Kitchen + Cocktails; Chef Scotty Schwartz of 29 South; and Chefs Thomas Tolxdorf and Sheldon Millett of The Ritz-Carlton Amelia Island. All wines were generously donated by Stacole Fine Wines. Guests were entertained by The Ritz Chamber Players and Molotov Cocktail Party. Photos by Jamie Borland Photography. The November issue of Jacksonville Magazine includes a stunning spread on The Legend Series Seven at Evergreen Cemetery. 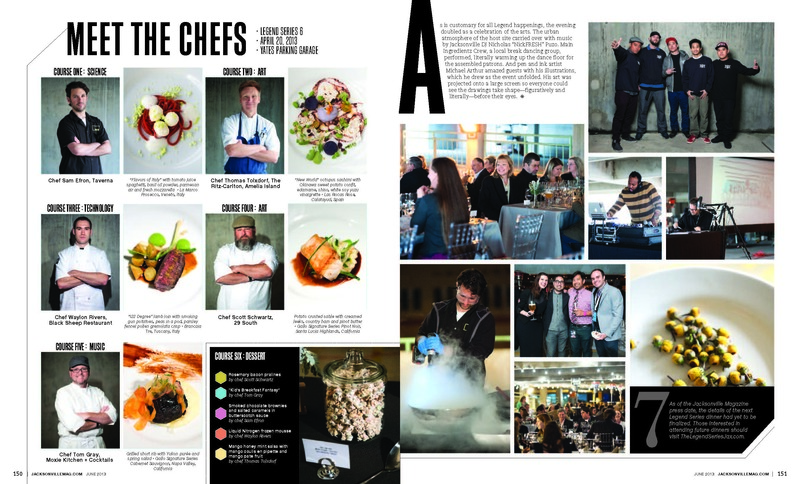 Read it here or look for it on newsstands this month. The seventh event in The Legend Series took place Saturday, October 19th at Evergreen Cemetery on the night of a full moon. Upon arrival, guests experienced an interpretive historical tour of the cemetery organized by the Jacksonville Historical Society. Courses were prepared by Chef Waylon Rivers from Black Sheep; Chef Tom Gray of Moxie Kitchen + Cocktails; Chef Scotty Schwartz of 29 South; Chef Thomas Tolxdorf of The Ritz-Carlton Amelia Island; and Chefs Karey Raulerson and Brian Siebenschuh of Restaurant Orsay. All wines were generously donated by Republic National. Guests were entertained by Robin Rutenberg + Naarah Strokosch who played classic songs, post-modern arrangements and improvised sounds crafted specifically for the event. 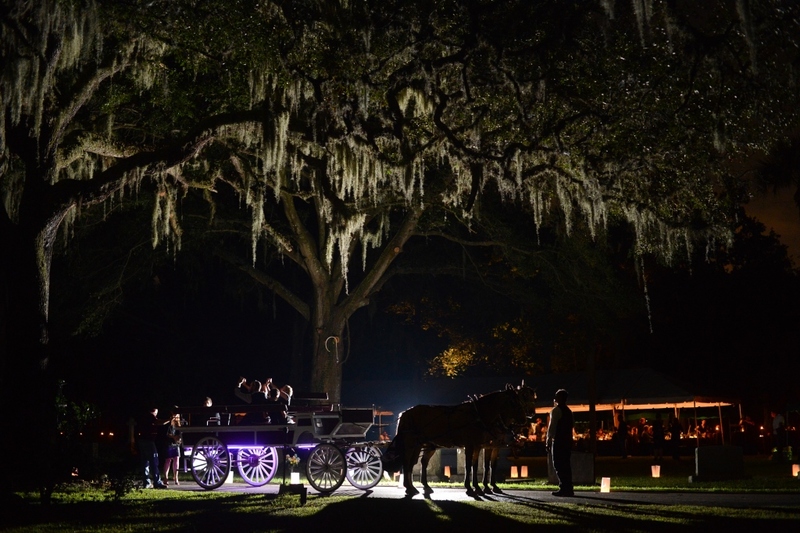 Horse-drawn carriages took guests on a nighttime tour of the cemetery at the conclusion of the event. Photos by Mark Brian Photography. Video by Mark Hubbard (see the video here). 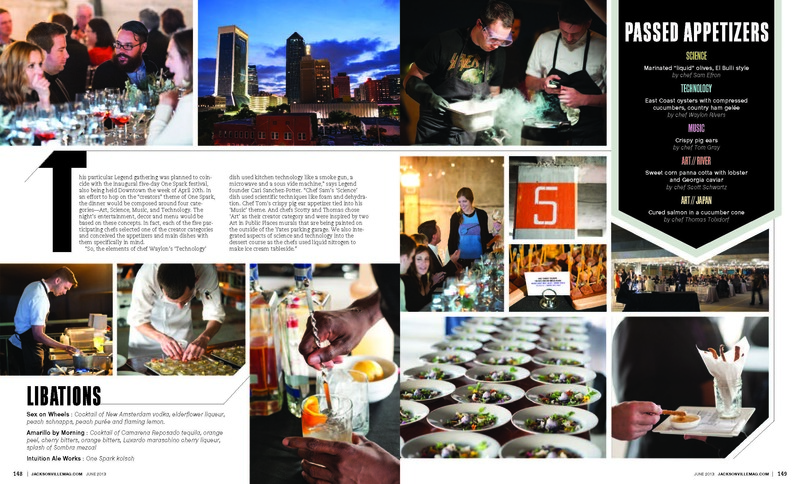 The event was featured in the November 2013 issue of Jacksonville Magazine. Click here to read the article. The June issue of Jacksonville Magazine includes a gorgeous spread on The Legend Series Six. Read it here or look for the issue on newsstands this month. 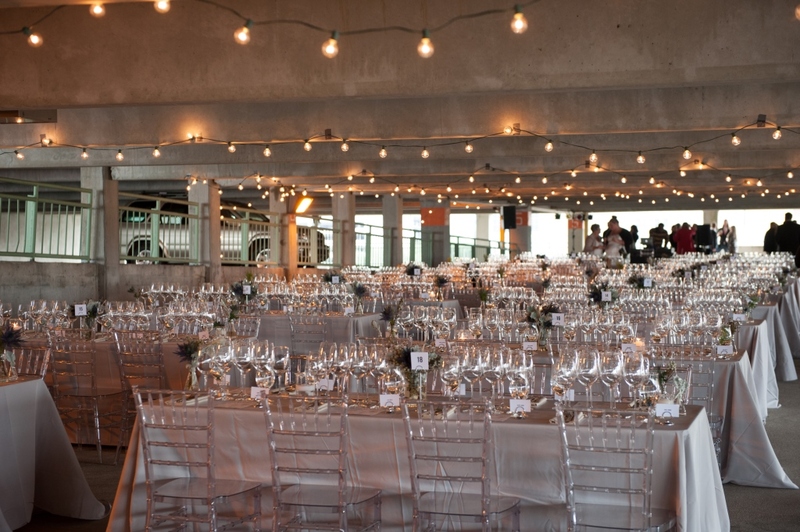 The sixth event in The Legend Series took place the evening of Saturday, April 20th at the Yates Parking Garage. The event was in partnership with One Spark. Courses were prepared by Chef Sam Efron of Taverna; Chef Waylon Rivers from Black Sheep; Chef Tom Gray of Moxie Kitchen + Cocktails; Chef Scotty Schwartz of 29 South; and Chef Thomas Tolxdorf of The Ritz-Carlton Amelia Island. All wines were generously donated by E&J Gallo Winery. Intuition Ale Works also sponsored the event. Guests were entertained by DJ NickFRESH. The Main Ingredientz Crew warmed up the dance floor with their b-boy style. 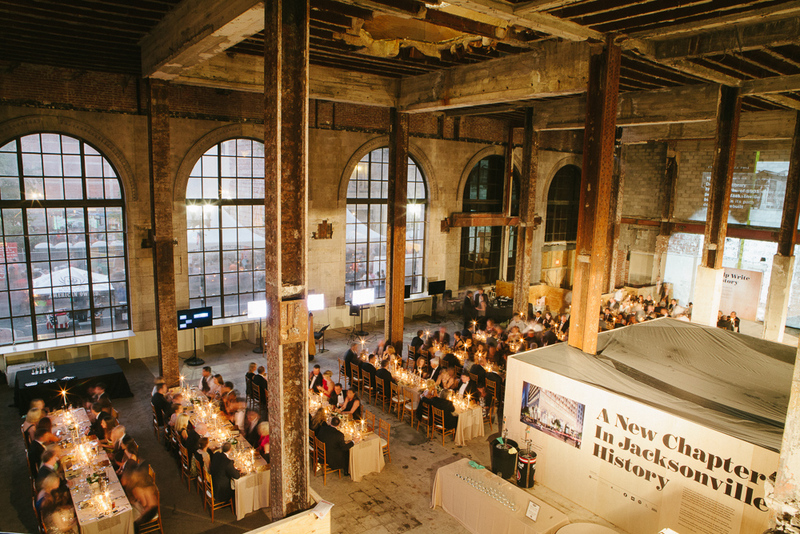 Artist Michael Arthur drew the event in real-time and his pen and ink drawings were projected onto a screen for guests to enjoy during dinner. 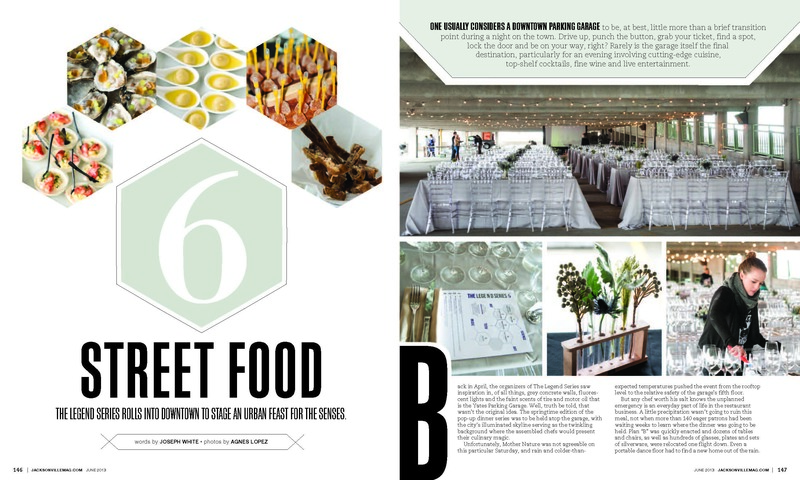 The event will be featured in the June issue of Jacksonville Magazine.